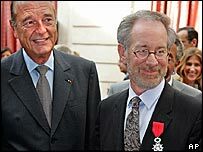 French President Jacques Chirac bestowed the country's highest honour on director Steven Spielberg at a star-studded ceremony in Paris on Sunday. He was made a knight of the French Legion of Honour to recognise his work fighting hatred and intolerance. Mr Chirac said Spielberg's holocaust film Schindler's List ensured that past atrocities were remembered along with heroic deeds. Among the guests were actresses Gwyneth Paltrow and Sophie Marceau. Mr Chirac said: "In this difficult time when intolerance, racism, xenophobia, anti-Semitism and fanaticism are on the rise again, it is essential that cinema, which touches each one of us deep inside, recalls the horror of what is unutterable. "It is essential that this form of eminently popular expression and creativity reminds everyone of the disastrous effects of hatred, intolerance and the rejection of others." In his acceptance speech, Spielberg praised France's fight against anti-Semitism in the wake of recent attacks against Jews and Muslims. "We have to work very, very hard to make people understand that we have to celebrate people's differences and not condemn them," he said. Spielberg also paid tribute to the French film-maker Francois Truffaut, who died 20 years ago. Truffaut, whose films included Jules et Jim and Le Quatre Cents Coups, was one of the stars of Spielberg's 1977 sci-fi movie Close Encounters of the Third Kind.